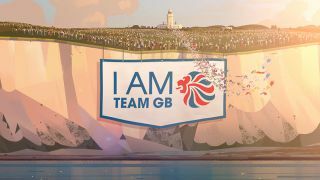 The National Lottery and ITV bring the nation together with their 'I am Team GB' animations. The Rio 2016 Olympic Games are just around the corner, and in the build up to the opening ceremony we can expect to see the branding for the Olympics everywhere. But in the UK, people are also gearing up for 'I Am Team GB', an event that aims to get local communities active. Taking place on August 27, 'I Am Team GB' is described as the nations biggest sports day. To inspire people and bring them together, Art&Graft, in collaboration with The National Lottery, ITN Productions, ITV Creative and ITV AdVentures, have created a set of charming animated commercials and promos. First up is the 'Road to Rio', which focuses on how Camelot is a key funder of Team GB. With every lottery ticket and scratchcard sold throughout the country helping to raise money for coaching and facilities, this cinematic animation features a flock of tickets transforming the lives of athletes. "We wanted to create the epic, cinematic scenes synonymous with an Olympics launch, yet also introduce a warmth and charm that is sometimes missing when representing our heroic athletic superstars," explains creative director Mike Moloney. The combination of 3D character animation and rich illustrations evoke painter Norman Wilkinson's beautiful representations of the British landscape. "We wanted the tickets to feel magical and mischievous as they spring to life in the morning sunlight then, once they join together in a flock, to feel graceful and elegant as they sweep through the air,” Moloney adds. The 'Road to Rio' is accompanied by 'I Am Team GB', a promo with a more down to earth feel. Concentrating on everyday people who can get involved with the Olympic Games, this animation uses a unique rotating camera to loop around scenes of characters participating in the community event. With both the promos now live, viewers can expect to see these animations on their screens in the lead up the the opening ceremony on August 5. Further cut-downs, event promos and print campaigns will also accompany the films.